Iron-carbon casting alloy which is standardized in DIN EN 1562. A distinction is made between whiteheart malleable cast iron and blackheart malleable cast iron. For whiteheart malleable cast iron, GJMW, the abbreviation GJ stands for cast iron, M for malleable cast iron and W for white. Similarly, for blackheart malleable cast iron, GJMB, the B stands for black. With regards to its carbon and silicon content, malleable cast iron is configured so that it solidifies without graphite (ledeburitic) and obtains its characteristic properties, specifically good toughness and good workability, during a subsequent heat treatment, the tempering. Therefore, before the heat treatment, malleable cast iron is a white cast iron solidified according to a metastable system in which all of the carbon is in a bound form as iron carbide (cementite) (Figure 1). Raw malleable iron castings are hard and brittle and practically unworkable and must undergo annealing (tempering). 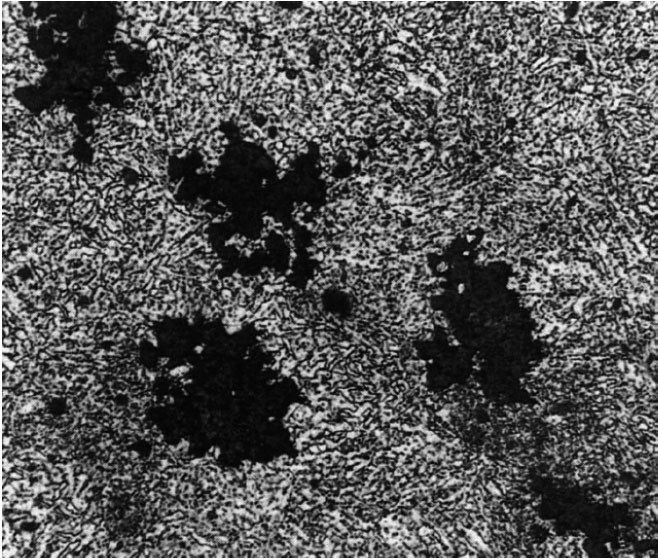 This causes a separation of the carbon as flakes of compact temper carbon with a low notch effect in the structure, similar to the graphite form in flake graphite cast iron. This gives the malleable cast iron a certain ductility and it is used for components which are exposed to dynamic demands, swinging or impacts and must withstand strong forces. Its special features, such as the thinness of the walls, toughness, high-temperature tensile strength, accuracy and resistance to wear make it a preferred material, especially for the use in pipe construction. Due to the nature of the process, malleable cast iron must be used for large batch production. 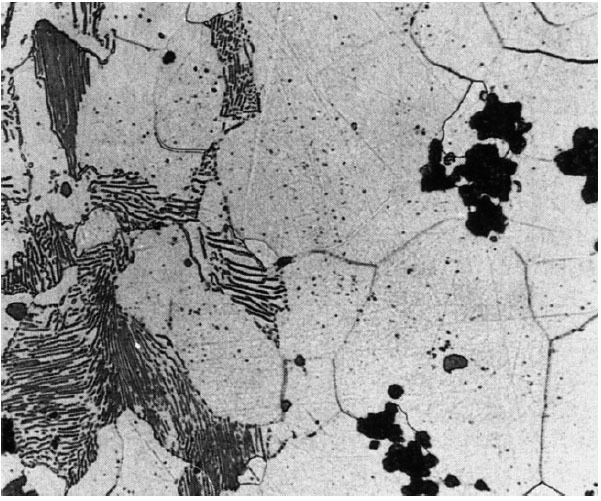 The tempering of the raw casting is carried out in a graphitizing anneal to break down the carbidic carbon which is bound in ledeburite into elementary carbon (temper carbon). Here, a distinction is made between two processes, decarburizing and non-decarburizing tempering. 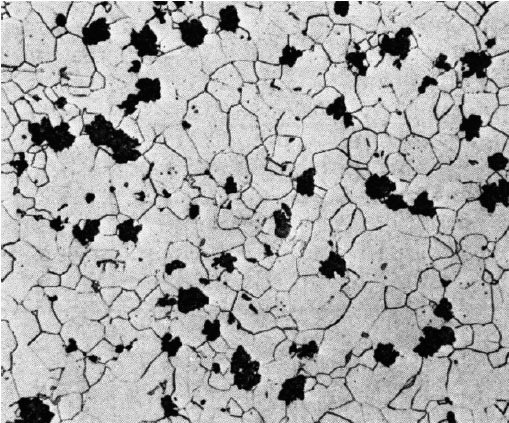 Annealed malleable cast iron which is decarburized has a light, white fracture structure in the edge areas and is therefore called “whiteheart malleable cast iron” (Figure 2), while in non-decarburizing tempering the fracture structure is dark which is why this material is called “blackheart malleable cast iron” (Figure 3). The decarburized edge zone consisting of ferrite. The transition area, consisting of a ferritic, pearlitic base matrix and several nodules of temper carbon. 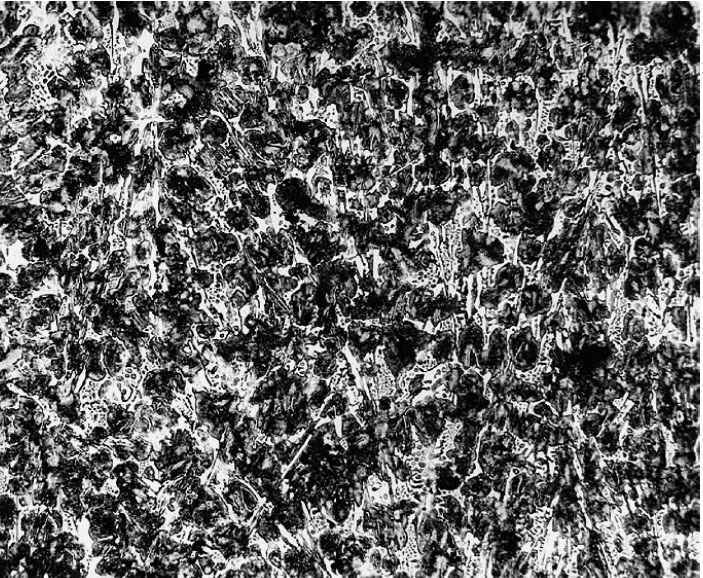 The core zone, consisting of a pearlitic base matrix and nodules of temper carbon. For blackheart malleable cast iron, the cementite breaks down in the first annealing stage at 950°C into austenite and temper carbon. During the second annealing stage, the austenite breaks down into ferrite and temper carbon. 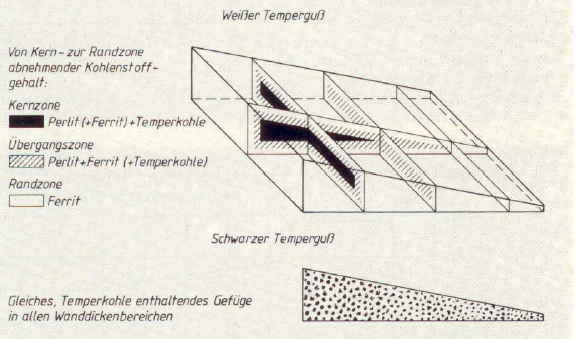 The base structure (ferrite, perlite, Figures 3 and 4) depends on the cooling rate in the eutectoid area. As a consequence, whiteheart malleable cast iron has a structure which is dependent on wall thickness; in contrast, the structure of blackheart malleable cast iron is the same in all cross sections (Figure 5).